“Okay, been there, done that. Pantheon. Maybe I’m just a victim of boring history profs @ 7am [in college]. . . 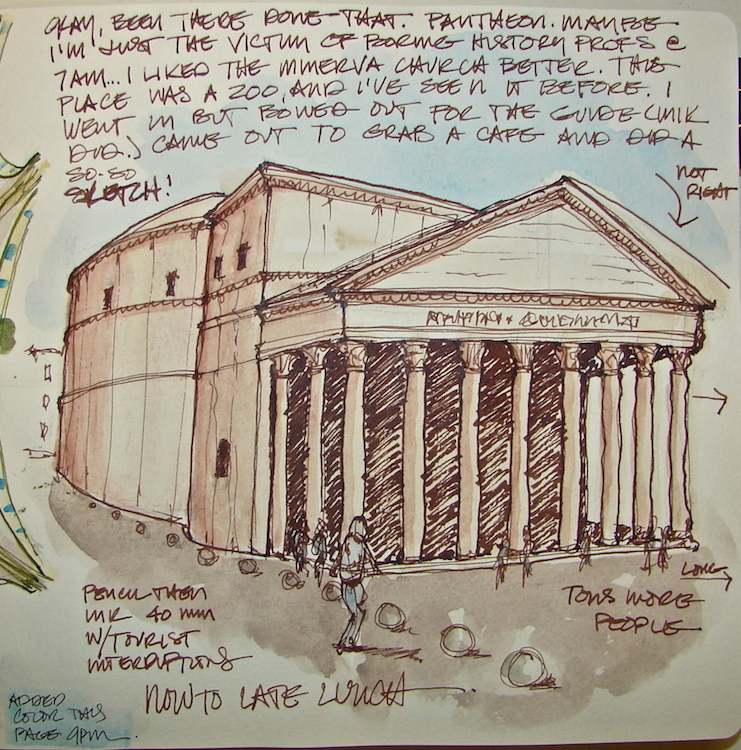 I liked the Minerva Church better. This place was a zoo, and I’ve seen it before. I went in but bowed out for the guide (which Mik did). 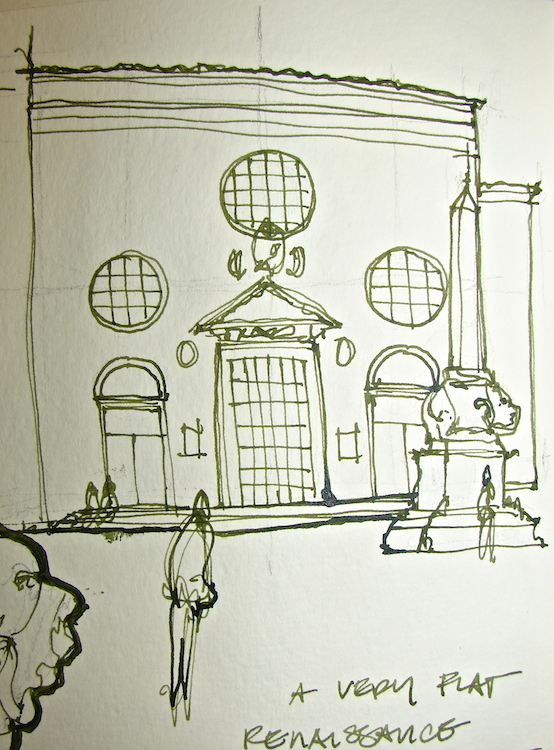 Came out to grab a coffee and did a so-so-sketch.” (Notes that say it is not long enough along the front facade.) “Tons more people. 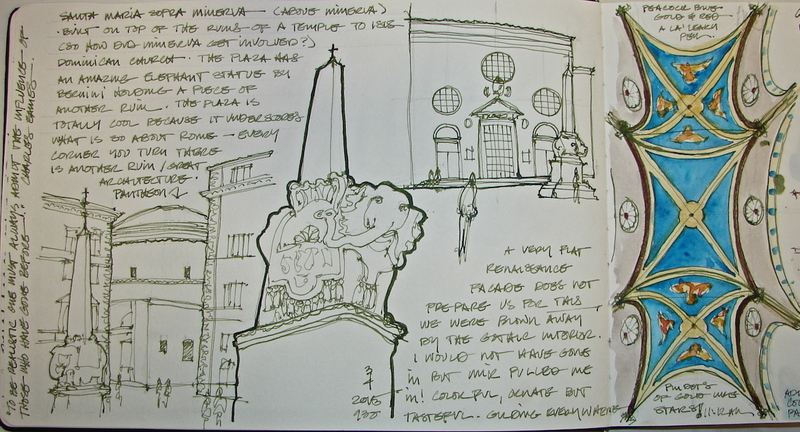 Pencil then ink 40 minutes with tourist interruptions. Now to Late lunch.” Added watercolor to the page at 9pm in the room. 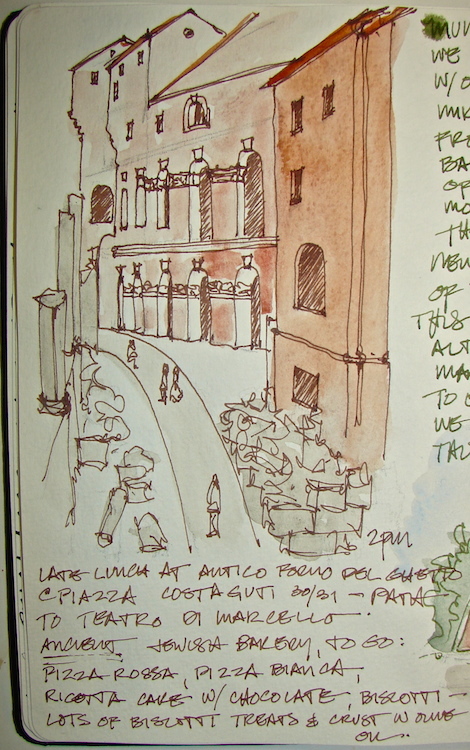 2pm “Late lunch at Antico Forno del Ghetto @ Piazza Costaguti 30/31. Path to Teatro di Marcello. Ancient Jewish bakery, [got it] to go: pizza rossa, pizza bainca, ricootta cake with chocolate, biscotti. LOTS of biscotti treats and [pizza] crust in olive oil. Ignore my early morning musing (that black blob), the start of the 4th, up at the crack of dawn. I would’ve posted earlier but had to wait because Mik’s ‘puter was packed!. Love you guys. Hope you are enjoying. This entry was posted in architecture, art, art journal, drawing, graphite, journal, pen & ink, sketchbook, watercolor and tagged art journal, Daniel Smith watercolors, De Atramentis Document ink, Fake Journal, Holbein, International Fake Journal Month, Pantheon, Pentalic HB woodless pencil, QoR watercolors, Santa Maria Sofra Minerva, Super5 ink, Teatro di Marcello, Temple di Apollo Sociano, watercolor. Bookmark the permalink. WOW! This is an amazing journey, Katie! Thanks you Ms S. Love your Beetles. 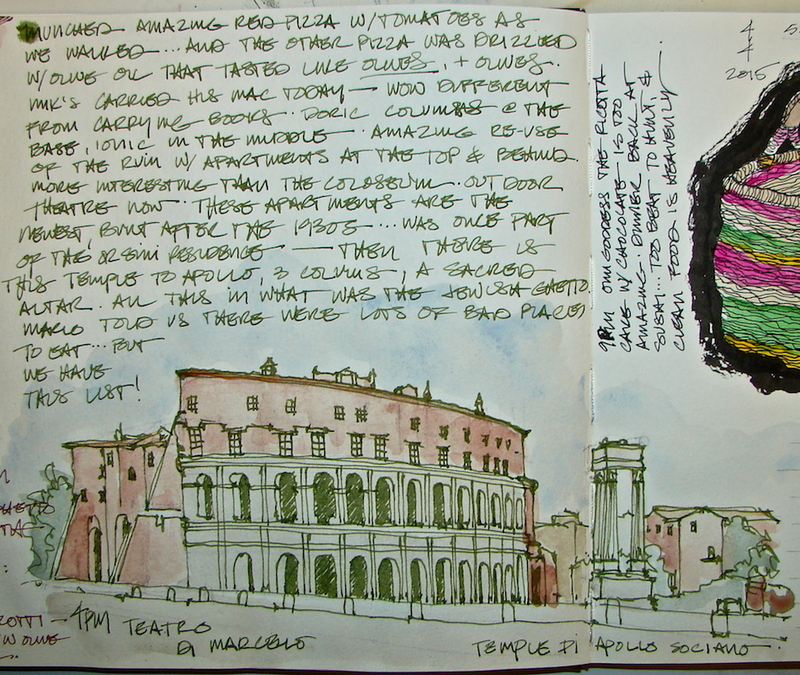 Love your posts about this trip through Rome…brings back great memories.